The Far-Eastern bandy school returned to the foreground decades later. The team from Khabarovsk had never been beaten on the russian stage for already 3 consecutive years and has firmly established now on the top of the world while shown through spectacular result of zero goals conceded in 6 matches. It has never happened in the 31-years long history of this tournament. It makes to talk on SKA-Neftjanik in glowing terms, although this team plays in Russia under the name of Erofej. Anyway they are now on a par with such teams like Enisej-1994, SDS and Kuzbass-2000 that left the most vivid mark during past decade. But unlike bandy schools in Krasnojarsk and Kemerovo, that one in Khabarovsk has never produced such the perfect product of the highest level that is in a great demand from the part of the Far-Eastern club today that has everything but high-level players and trainers from their hometown. So there is priority in a medium term to bring young guys from Erofej to the senior team to solve the recruitment problem and ensure continuity of generations lost in the 2000s. The modest result in the final, only 2:0 (0:0), shows no total superiority of the Far-Easterns over swedish Vetlanda BK. The score could easily be double-digits but perfect performance of a swedish goalkeeper and only astonishing levity of the russians upon attack’s completion did not allow to score much more. 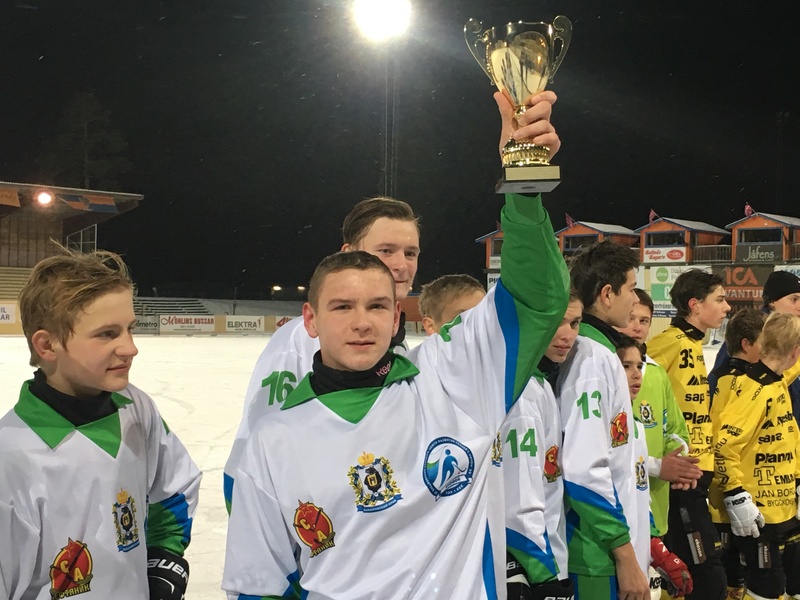 SKA-Neftjanik dominated the Kosa-mini not only due to their leaders as it usually happens, especially in the children’s bandy, but obviously due to the fact that they leveled gap in class between the leaders and other team members. The leaders were many of players but they did not strike the eye and differed only by that they can perform a little bit better and faster than their team mates, so difference was so insignificant so one can say that the whole team won the Cup. Maybe one more russian club, Rodina from Kirov, could resist Khabarovsk in the final more worthy than Vetlanda, as it did Volga from Uljanovsk one stage before, but Rodina equalized in the last minute but nevertheless left way to the final to swedes while lost aftermatch penalty shots. Volga had an equal fight vs SKA-Neftjanik in ½ final but made a few mistakes and has been punished with 3 goals by oilmen. So, the russians held a bronze match instead of the russian final where Rodina took over Volga 3:1 (2:1) and set emphasis on shifting axle of the russian hierarchy on to international soil. Thus, World Cup Kosa-mini 2016 confirmed superiority of the russian teams over all others. The main difference is that the russians play to achieve results rather than to play for fun. They start their way to Bollnäs well long before and go to the target over years. The tournament showed that they actually have no competitors today and if they do not stop destroying themselves it can provide very bright future for all russian bandy in general.